Samsung is currently investigating a report that one of its Galaxy S3 handsets exploded in a user's car in Ireland, just weeks after another model allegedly exploded in a Korean schoolboy's pocket. The news comes as the electronics giant gears up to launch its flagship handset in its native Korea on Monday. 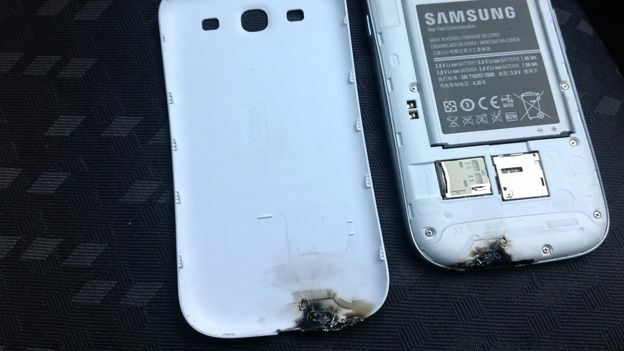 The owner of the device wrote: "So I driving along today with my Galaxy S3 in my car mount when suddenly a white flame, sparks and a bang came out of the phone. "I pulled in to look at my phone, the phone burned from the inside out. Burned through the plastic and melted my case to my phone. The phone kept working but without any signal. "I brought it to the carphone warehouse and they told me that they couldnt replace it for me that they had to send it off to be checked out first. No even replacement phone, left with nothing. "The phone was destroyed and it slightly burned a piece of plastic on the inside of my car. "And they are refusing to give me a replacement they had to send it off. Probably nothing I can do, but Im really annoyed. "That could have burned the side of my face or through my pocket and my leg, or set fire to my bed. Its very dangerous." Samsung responded to the Dublin-based user on its official blog, saying: "Samsung is aware of this issue (in Ireland). "Once the investigation is complete, we will be able to provide further details. “We are committed to providing our customers with the safest products possible and are looking at this seriously." This isn't the first report to surface of a dodgy Galaxy S3 handset. A school boy in Korea complained when his handset's battery exploded while in his back pocket. Samsung claimed the external pressure pre-empted on the device was what caused it to explode. Meanwhile, other users have reported overheating problems via internet forums. The consumer electronics manufacturer launched its flagship smartphone in Europe in May and subsequently in the US on Thursday.